Lost: 17 Jan, 1942 at 0735hours(31°50'00'' N-026°15'00'' E) approx.Pos. north of Sidi Barrani by 1 torpedo from German U-133 (Hesse). and caught fire from bow to stern. 12 killed.The Dutch destroyer HNoMS Isaac Sweers towed the destroyer clear of the burning oil on the surface. Most crew members were then transferred to the Dutch destroyer by boats and were landed at Tobruk in the evening. The burning destroyer had to be scuttled and sank after 90 minutes. History: HMS Gurkha had been escorting the Malta convoy MW-8B (four fast transports covered by Admiral Vian´s Mediterranean Fleet cruiser force), which arrived Malta on 19 January without further casualties. 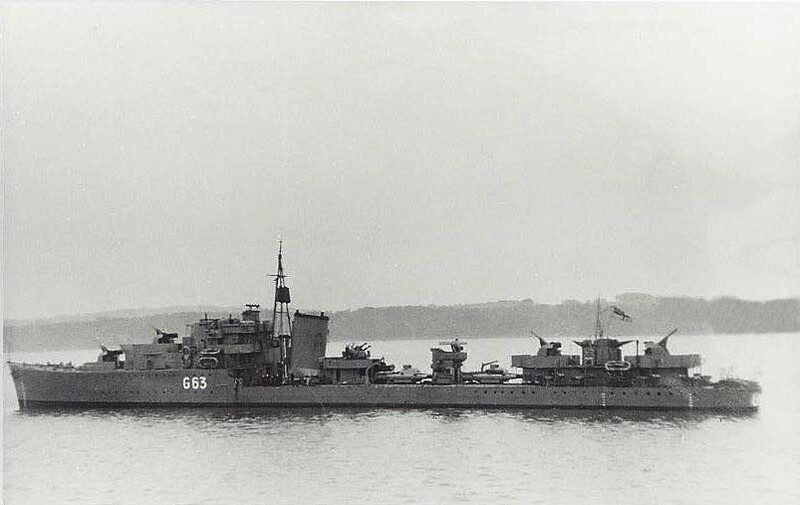 At 0617hours on 29 September 1941, HMS Gurkha got a radar contact with the surfaced Italian submarine Diaspro in position 37.32N, 06.45E and was shortly thereafter missed by two torpedoes, which passed under the destroyer. Together with the Dutch destroyer HrMs Isaac Sweers, she engaged the submarine, but without result. The destroyers were part of the Force H (Adm. Somerville), returning from escorting a Malta convoy during Operation Halberd. Around 1030hours on 30 September 1941 the Italian submarine Adua (offsite) was sunk north-west of Algiers by the British destroyers HMS Gurkha and HMS Legion.